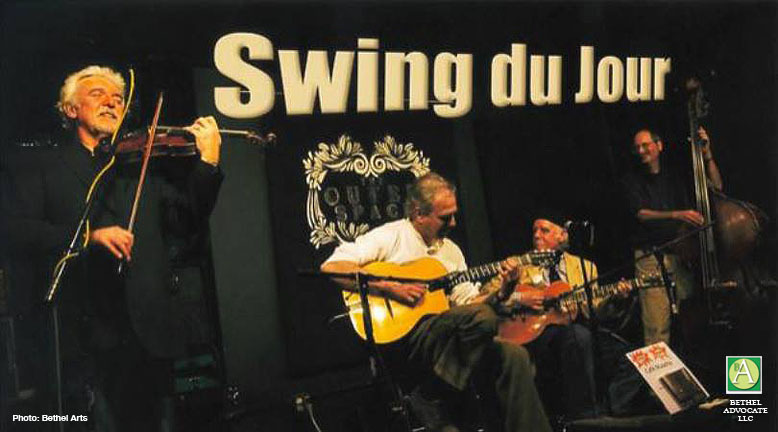 The Third Thursday Jazz, Featuring Swing du Jour – An Evening Of Gypsy Jazz, is Thursday, May 16, 2019 at 6:30 PM – 9:30 PM, at La Zingara located at 8 P.T. Barnum Square in Bethel CT. The event os hosted by Bethel Arts. Howie Bujese: A native of Bergen County, New Jersey, Howie first became interested in the violin in the late ’60 when watching a PBS special he heard American Traditional fiddling for the first time. 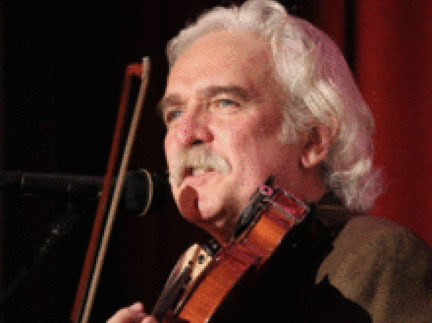 Over the years Howie studied and learned the traditional fiddling styles of the Southern Appalachians, Ireland, and Scotland and his curiosity eventually led him to Gypsy Jazz. Having no formal training he learned by way of the aural tradition, listening, watching and playing. Howie performs internationally and has played with a broad range of artist from Jonathan Edwards to David Amram to Noel Redding to name a few. Along with Swing du Jour, Howie and his wife Pam Bujese are members of Cool Struttin’, a quartet playing the Great American Songbook, and also for over thirty years with the NYC area acoustic swing band Out to Lunch. 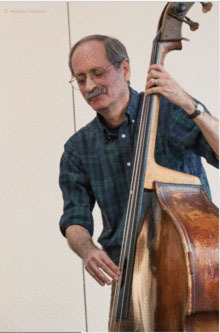 Eric Van Laer: Bassist, studied music at St Lawrence University and privately with Dr Lyn Christie, Linc Chamberland and Michael Moore. Have played with the Norwalk Symphony, the RPM Band, The Waistcoat Rouge Jazz Band, The Bearcats, The Al DiMarco Duo, The Brian Butler Quartet, Cafe Musette, Vardology, and Swing du Jour in addition to freelancing extensively throughout Fairfield, Westchester & New Haven Counties. Was the house bassist for 15 years at Ginny Avery’s monthly jam sessions. Norman Plankey: Rhythm Guitar. 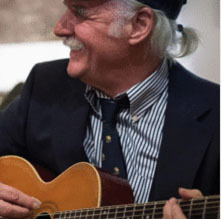 from his earliest high school bands, with drummer Kenny Aronoff and guitarist Joe Finn, Norman has been playing for over 50 years; all over the stylistic musical map from Motown covers, jug-band/homemade string band, Bluegrass/Old Time, to working with Pete Seeger in the mid-80s. As a bandleader, he has founded/organized several bands in the swing realm – The Swingaholics (Western Swing), Norman and the Rockwellians (little big band), and Vardo Swing (electric mandolin-driven small group swing). With Swing du Jour, Norman is tackling the devilishly arduous task of rhythm guitar and providing La Pompe (the driving rhythmic pulse).